Here is a very elegant meal that can be made for a special occasion. It is something a bit beyond the normal Sunday Roast and you will definitely get lots of "Wows" because it is looks good, is meltingly tender and tastes incredible! Buy the very best Beef you can afford. For this recipe I recommend a large whole rump. I made the pictured rolled roast with a 4kg prime rump. Always buy meat with white fat and plenty of it. It will melt off during roasting and you can trim any off that you don't want. 2 cups cooked and drained chopped swiss chard or spinach. about 20 pieces of garlic chopped. Two teaspoons ground black pepper. Start by cutting the roast into a long flat slab. I do that by cutting ALONG the grain, NOT across it. Cut down about an inch and then keep cutting to make a unrolled roast. 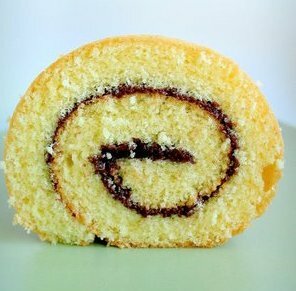 The best way I can describe this is to thing of a swiss roll cake. You are going to put the spinach/bacon stuffing in instead of Jam! Start by frying the bacon,leeks and mushrooms together. Add the spinach and cream and reduce it until there is almost no liquid. Be careful not to burn it. Use a thick bottom pan or pot and very low heat and be patient. You can also add a little flour paste to thicken, but be careful not to mush up the texture. Finally un-roll your Beef Rump on a flat surface. Spread the filling over it evenly. sprinkle a little dried thyme and a few sprigs of Rosemary on. Sprinkle the raw garlic on. Add any other seasoning that you like at this time like the black pepper. I always avoid putting salt in during any cooking because it tends to draw out juices. Keep the filling a little back from the end of the roll otherwise it squishes out when you roll and tie it. Roll the rump back up and secure it with 3 or 4 cotton strings. Place it in a large roasting dish, fat uppermost, and roast it for 3 hours at 200C (390F) Baste with the juices every 30 minutes. If it looks like it is drying out (depends on the grade of beef) cover just the top of the meat with a square of foil. In the last hour add your roast veg. I used peeled and quartered Beetroot, large whole carrots and butternut. Finally make your gravy out of the pan juices a cup of semi sweet wine (add a little sugar or syrup if using a dry wine) and cornflour. Season and taste your gravy...it is a key to a perfect roast! This sounds delectable...makes a waterfall in my mouth! And to think that my measly last post was for garlic pretzels. Geesh. Merry Christmas! Ha Ha! At least you BLOGGED! I have been cuffing it for too long now! Keep up your great blog. Really enjoy it. What an amazing looking meal Archi! Very hungry now! Merry Christmas! IT LOOKS VERY YUMMY BUT CAN I DO THIS WITH A PIECE OF LAMB LIKE THE BREAST ? You know Lamb breast would probably work very well. Also I meant to write in this recipe that one could make this from any size roast..just reduce the spinach, mushrooms and bacon accordingly.